We are women helping women from all walks of life by empowering them to reach their full potential: personally,professionally and politically. You will participate and have a voice in programs and projects that BPW supports: pay equity, work place equality, women's self-efficiency and more. Join our Facebook group by clicking here. Central Montgomery County Business and Professional Women hosted Norristown Preservation Society at their most recent member meeting. NPS volunteer Elena Santangelo ( standing left) gave an informative talk about Selma Mansion's history and the successful efforts to preserve this local treasure. Come to the Mansion for a feee community event on Sat June 16th. CMC BPW will be a vendor. Rockstars of the month get rock candy and mini Nike statues. The winged goddess of victory is BPW's national symbol since 1919. President Becky Shoulberg gives the awards to her mom, Molly Shoulberg (right) and her Aunt Barbara Cressman. The sisters grew up on Forrest Avenue accross from Selma Mansion. 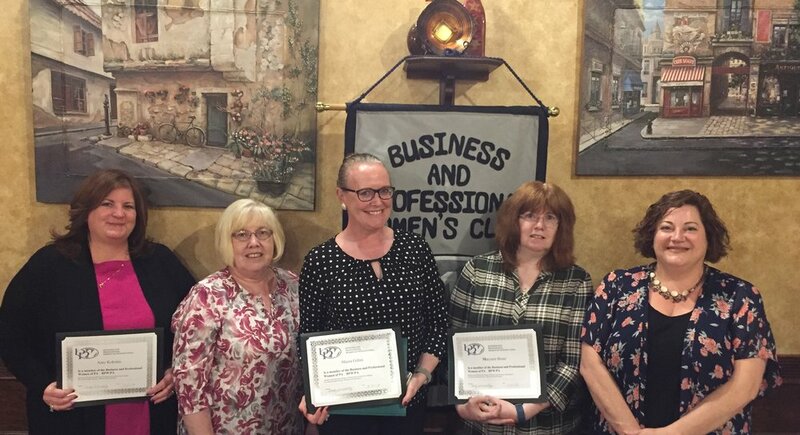 Central Montgomery County Business and Professional Women welcomed their newest member, Antonietta Pendleton owner of Italian Specialties (right). She joined on the spot as she came with her neighbor and guest speaker, Colleen Falicki, founder of Back To Earth Compost Crew ( in green for Earth Day) . President and Vice President (from left), Becky Shoulberg and Sue Soriano, met Colleen at a Montgomery County Chamber of Commerce Women's Resource event. Lots of crafts and camaraderie were shared at the Ice Cream Social April 18 at Mary Walker House on the grounds of the Coatesville VA. Commaner Sandy Miller introduced us to new staff and residents during a tour. Journals were donated and we got a new recruit, welcome Lorri Darbes! Women Joining Forces! 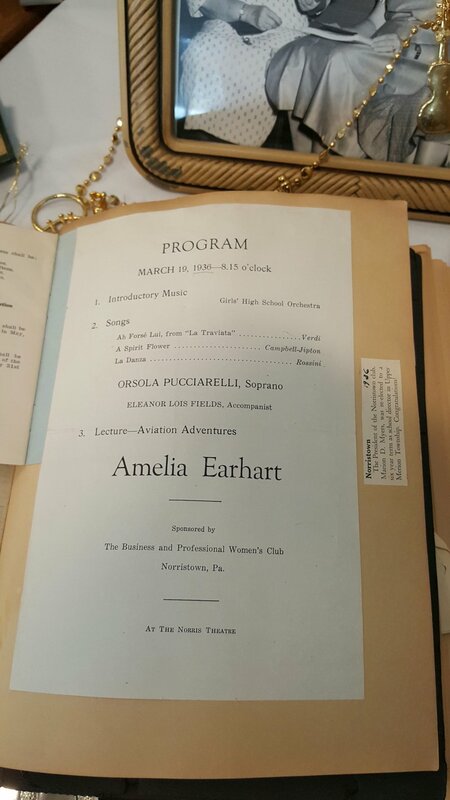 Soprano Scholar and Marian Anderson National Historic Society COO, Jillian Patricia Pirtle performed with her peers songs from their "A Soul in Song A Night of Spirituals" concert. You can watch the video here. was invited to speak at Central Montgomery County Business and Professional Women's February meeting. Vice President, Sue Soriano (seated right) and CMC President, Becky Shoulberg create programs that focus on local resources and gems. The Dragon's, based at Riverfront Park, provide many oppurtunities for youths and adults to enjoy the camaraderie and confidence that comes with participating in this ancient Chinese water sport. Learn more about each club on their Facebook pages and websites. New Year, New Members was on the agenda at the most recent meeting of Central Montgomery County Business and Professional Women. From left, Janet DiCenzo, Glenda Neal, President Becky Shoulberg, Farrah Gaskins, Gail Young Davis and Treasurer Noreen Morello. The club has a diverse membership with women in many fields including STEM industries. For 90 years, this BPW chapter has been empowering women to grow personally, professionally and politically. 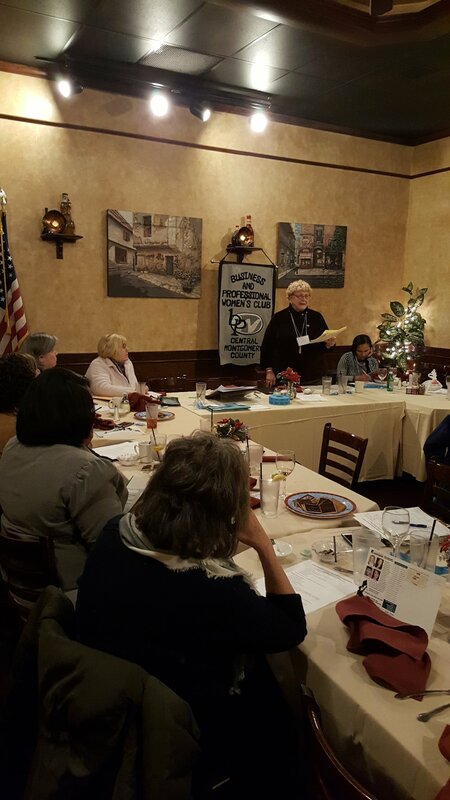 Longtime CMC member, Norma Zarfoss gave a stellar talk on BPW PA Foundation during our January meeting. Norma is usually joined by Past State President, Nancy Werner, who will be back to is real soon! Foundation supports scholarships and Edith Oler emergency fund. Visit bpwpa.org to learn more. Our first annual Holiday Bingo Fundraiser at Jem Restaurant waa a huge sold out success! Thank you to all the Norristown area and King of Prussia merchants who donated. Two grand prize raffles worth $500 each were donated by Hampton Inn and Hilton Garden in Oaks with limo rides for 8 through Valley Forge Park from Smith Transportation, gift cards to multiple restaurants and skin care baskets from Keihl's at Neiman Marcus! We also filled the money tree for Norristown State Hospital and scholarship fund for MCCC. Join us next year! December 6. Montgomery County Foundation founder, Virginia Frantz (right) hosted their annual womencentric conference at The Presidential. CMC member, Judge Cheryl L. Austin, (next to Virginia) is recipient of the Woman of Distinction award. Cheryl's message echoed BPW values: surrond yourself with supporters and ask for help. Barbara Jean Maresca (left) is on the stellar planning committee and CMC members VP Sue Soriano and President Becky Shoulberg also attended. 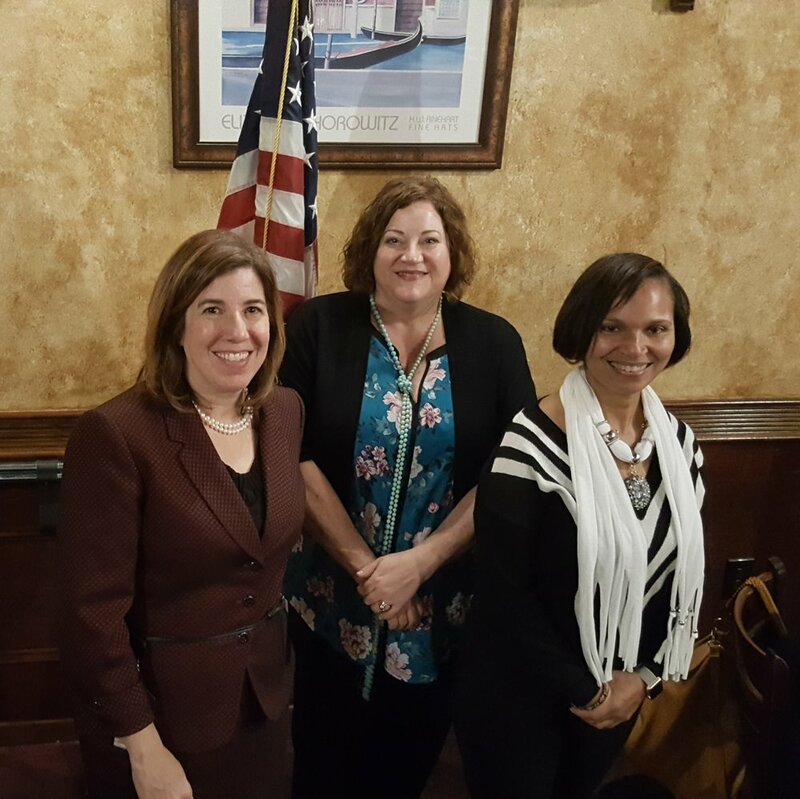 At their November meeting, Central Montgomery County Business and Professional Women President, Becky Shoulberg, (center) invited Secretary of Transportation, Leslie S. Richards (left) to interpret BPW PA state theme, " Bridge to the Future". Vice President Sue Soriano (right) echoed Leslie's experience working in a field dominated by men and the importance of showing young women the changing face in the workplace, especially in the STEM industries. The annual autumn Mega Mixer at Dave & Buster's with four Chamber groups was mega awesome! We are officially new Montgomery County Chamber of Commerce members! Up to five CMC members can attend any event! At our September kickoff to our 90th year, Treasurer, Noreen Morello and President, Becky Shoulberg welcomed CMC newbies. Holding their new member certificates (left to right) are Amy Kokoles, Mo Gillen and Maryann Buser. Welcome to BPW! Far left photo: Thank you Megan Anteparra and Simone Snead for keeping us posted on the growth of Cribs for Kids and other Montgomery County Health Department initiatives. Keeping babies safe is near and dear to our long time member, Agnes Ferrara. Retired Executive Director for VNA. Center photo: Donna Fiedler, MCCC Foundation, accepted scholarship check with student Samantha Watchous. Far right photo: Bonnie Dudley's P"HER"L of wisdom was, "Patience is a virtue..."
CMC celebrated 90 years on May 6th at the lovely Montgomery Township Recreation Center as arranged by BPW PA Legislation Chair, Ginny Bailey and a good time was had by all! We were honored to have current BPW PA State President, Susan Vladika, join us and many other guests from other locals too including our very own Past State President, Nancy Jean Werner. Thank you to Barbara Jean Maresca for arranging stunning memorabilia tables. A touching tribute to Dr. Carmella de Rivas and Barb Drechsler and all the members who have passed was presented by Priscilla Brandon. We had raffles galore and all donated! 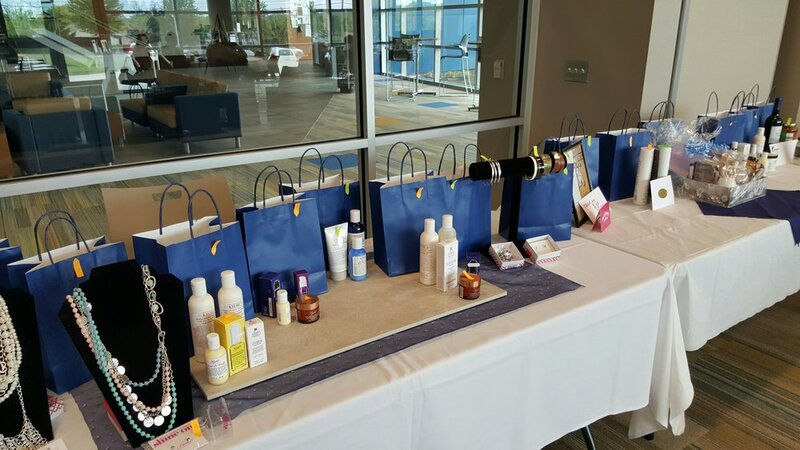 Thank you to Angela Larkin of Kiehl's Skincare at King of Prussia Neiman Marcus, Karen Alder of Premiere Design Jewlery, Tantra Salon, Target, Special Event Flowers, Sauce Lady, Paladar Rum Bar and Latin Kitchen, Gateway 2 Diner, Pepper's and Noreen for a Tea Set. We raised alot of money for our outreach and scholarships. Norma Zarfoss had been storing this Nike for years and took her to be restored as a gift for President Becky. The theme of the party was based on Nike as stone represents strength and endurance through the years. To read the Times Herald article and to view more pictures, please visit our Facebook page. In honor of Earth Day, Central Montgomery County Business and Professional Women welcomed (from left) Dave and Audrey Harding of Marvelous Monarch Butterflies. Past State BPW President, Nancy Werner hosted the evening (center) and is shown with CMC President, Becky Shoulberg. Monarchs travel all the way to Mexico and back to the Northern states each year. Guided by the magnectic pull of surface minerals, millions make this journey and only a few survive the round trip. Learn more about the Monarch Sanctuary in Souderton at:https://marvelousmonarchs.wikispaces.com/Home+Page and CMC BPW: centralmontgomerycountybpw.org. Sue Soriano will be representing District 11 at BPW PA State Convention for Individual Development in June. Jennifer Van Ingen and Sue both gave awesome speeches, on April 1st, at our Spring Board meeting with their interpretation of ERA. ID Chair, Gerry Fioriglio and judges had a tough job. From left to right: Sue Soriano, Gerry Fioriglio y Jennifer Van Ingen Franconia Heritage Conference and Banquet Hall. Ana Ferreira in traditional folk dance attire from Portugal surronded by her family. Thanks to you and mom, Christina Melhor for participating in District 11 World Affairs on April 1st.